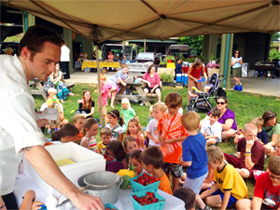 Established in 2010, Farm Fresh Kids is all about learning, community and local food. Plus, it’s a lot of FUN! Farm Fresh Kids is an incentive program about healthy eating and active living, giving kids the power to decide what foods to buy and consume. It was created by the Abingdon Farmers Market to incentivize children to increase their consumption of fresh produce, in addition to receiving nutritional and physical education lessons from different community groups. Every Tuesday afternoon market starting at 4pm in the summer, children receive hands-on experience in choosing fruits and vegetables, tasting and preparing different foods, and interacting with each other during active play. Following the interactive lesson, children are given a $2 Fresh Buck coupon to spend on healthy foods at the market. Some children buy broccoli, squash, apples, strawberries, and some even leave with vegetables like fennel. Fresh Bucks are a successful way to keep children attending the program in order to receive more educational resources, thus building health habits. As families become more accustomed to shopping at the farmers’ market, parents experience how easy it is to expose their children to different tastes and healthier foods should become more common on the kitchen table. Abingdon Farmers Market began accepting SNAP (formerly known as food stamp) benefits in 2009, with the proud distinction of being the very first farmers market in Virginia with the capability to process EBT cards. When available, the AFM also offers a Double Bucks program which doubles the value of federal nutrition assistance spent at the market, helping people bring home more locally grown fruits and vegetables. Not only do farmers gain new customers and make more money, but low-income consumers also eat more healthy food, and more food dollars stay in the local economy. Your local farmers market is more than a place to buy food; is a place that you and your family can connect with the surrounding community. Unlike grocery and convenience stores, the farmers market gives you a chance to interact with the person who produced your food. That person can give you tips, recipes and insight on how to best prepare their product-whether it’s a bushel of tomatoes or a cut of meat. Bring your SNAP EBT Card to the info booth before you shop. Market staff or volunteers will swipe your card, and give you wooden tokens in that amount to go shopping. Buy any SNAP-eligible foods at the market with your tokens. When funds are available, the AFM will match what you spend with FREE Double Bucks – up to $20, per market day. Use them right away or later on to buy locally-grown fruits & vegetables. Shop the farmers market first with your regular grocery list. You’ll be surprised at how much of that list you can find at the market. Arrive at the market when it first opens for the best selection of items. Bring a cooler with freezer packs to keep any meat or dairy products cool while you shop; and bring your own bags to cut down on plastic bag usage. Bring your family – we often have entertainment, cooking demonstrations and kids activities! What is the Senior Farmers’ Market Nutrition Program (SFMNP)? In Virginia, we call it Farm Market Fresh for Seniors! Virginia’s Farm Market Fresh for Seniors program helps eligible seniors get fresh, tasty, and nutritious locally-grown fruit, vegetables, and cut herbs. The program also supports local farmers and farmers’ markets in Virginia.